It’s good to get away and it’s good to come home again. Santorini was more beautiful and more of a dream than I ever imagined. This post is going to be in parts because there are SO many photos and just so much to say about it. I think we definitely accomplished all of our bucket list and more. We stayed at the Heliotopos Hotel in Imerovigli in Santorini. I would highly recommend staying here as the hotel was stunning, the staff were so hospitable and accommodating, and the village it is located is in super quiet, yet central enough to the busier parts like Fira, which has more of a night life. I could not have been happier with our stay! 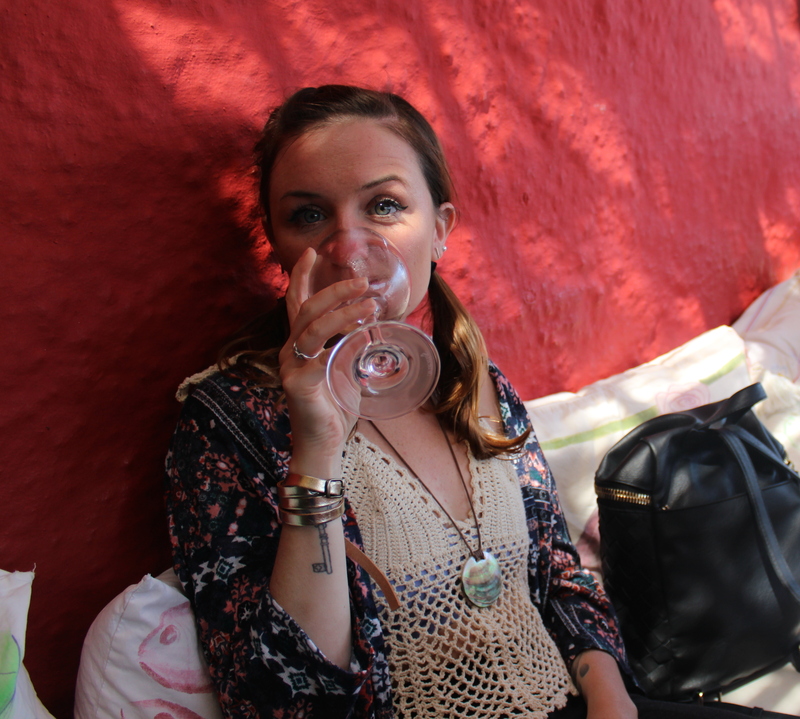 I am having serious Greece withdrawals looking at our photos (about 800 to be exact!) and want to cry now…I just feel incredibly blessed that we were able to go at all. This was our view looking to the left of our balcony…our neighboring hotel and the rock behind is Skaros rock. On one of our first days we did the walk from Fira to Oia….the view along the way was incredible! Once you arrive in Oia, you are greeted with this beautiful chapel and archway, with love locks! I quickly became obsessed with the churches and tiny chapels in Greece. Many of them are white with the blue dome tops and a cross on top. We made sure to catch the sunset, especially when we first arrived, back at our hotel. Here you can see the steps leading from Oia down to Ammoudi Bay to the right. Welcome to the Santorini sunset. I think I will do a whole part on this alone. I could not stop snapping photos of the most stunning sky I have ever seen. Actually, I could not stop snapping photos of every.single.thing. I am so glad I did! Looking back on them now makes me want to cry, I just feel so blessed for being able to go. But I am so glad we did. We visited the areas of Oia, Kamari, Perissa, Pyrgos and Exo Gonia (my absolute favorites), Fira(capital), Akrotiri… and many little places in between. More parts of our Greece adventure coming up… architecture, food, beaches, ruins….what would you like to hear about? Thank you so much! It was absolutely wonderful… the quad was super fun once I got over my fear a little bit! I will definitely write a post dedicated to Greek food so no worries… thank you so much for reading! Looks beautiful, can’t wait to go this summer! It was stunning!! That is amazing that you are going you will have the best time!! Your photos are absolutely stunning!! I can see why you are having withdrawals, I wouldn’t want to leave that place!! Greece is right at the top of my bucket list and this post just made me want to go even more! Thanks for sharing!! Thanks for reading Daniella- you definitely have to go if you can, it is SO worth every minute!! Loved this post! I went to Santorini this time last year, staying in Imerovigli and also did the same walk you did but from Oia to Fira – fabulous, but if I do it again I won’t be wearing flip-flops!!! The only thing that annoyed me was the vast amount of Japanese tourists taking selfies, often in the middle of our meal, like elbowing us out of the way to get the better view!! But we overcame it and took deep breaths, otherwise gorgeous! Jane- thanks for sharing your story!! I can totally see that happening… we saw a lot of Japanese tourists taking selfies with their huge selfie sticks lol glad you had a great time though! Lovely place would love to go there… after seeing your blog I am really tempted.. These photos look amazing. I might just have to go for the sunsets alone. Yes you should! Thank you! Beautiful pictures!! Ever since I saw the Sisterhood of the Travelling Pants (I know, haha) i’ve wanted to go to Santorini! Haha, seriously? That IS funny! Hey Kasia- thanks so much for the comment! We went in May and I have to tell you ( the locals told us as well) that has to be one of the best times to visit. Initially we were not sure if it would be warm enough to swim. And it was in the high 70s every day but the sun there is SO strong! By the end of the day you def want to take a dip. And the tourists come mostly june- august is what we heard. I’d say June would be nicer in terms of the water not being as cold, though!